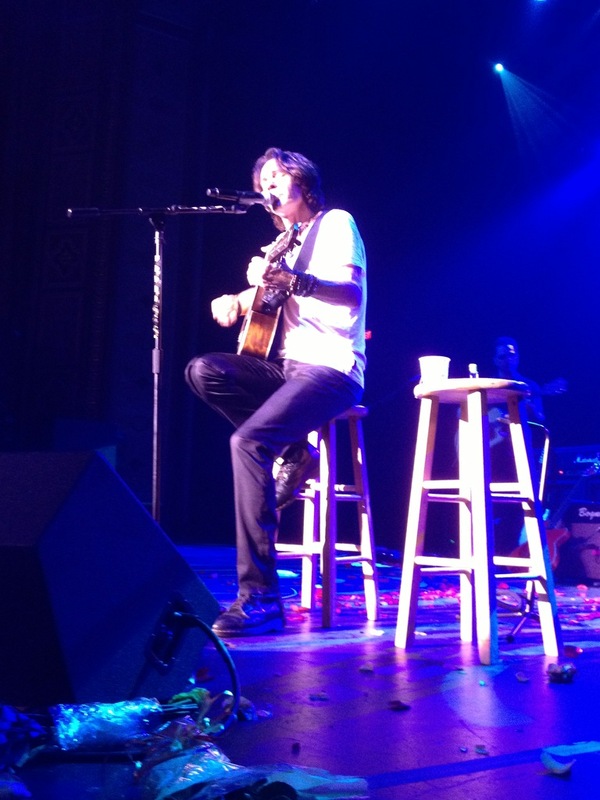 It’s called the Light Of Day and one wonders if daybreak may come before the last act exits the stage at the Paramount Theatre in Asbury Park. The annual concert organized by the Light Of Day Foundation to benefit Parkinson’s Disease research has grown into a full fledged city wide music festival in the 13 years since its modest start as a birthday party for Parkinson’s patient and music industry insider, Bob Benjamin. This year’s main stage shows at the Paramount featuring a multitude of rock acts stretched into a more than seven hour music marathon on Saturday night. The show had sold out in less than an hour without any of the talent being announced, largely on speculation that Bruce Springsteen would once again close the show as a surprise guest as he had nine of the previous twelve years. But the Boss did not show this year, giving fans the heads up on his website the day before that he would “be away with family.” But there was plenty to satisfy a wide range of musical tastes with performances by some of New Jersey’s favorite musicians. Stand-out sets included Garland Jeffreys with an impressive cover of “96 Tears” and his rousing closer, “Hail Hail Rock ‘n Roll.” An on-fire Willie Nile kicked down the doors with his powerhouse “One Guitar” and despite technical difficulties John Easdale and Dramarama soldiered through one of the most beautifully sung and emotionally delivered short sets of the evening. 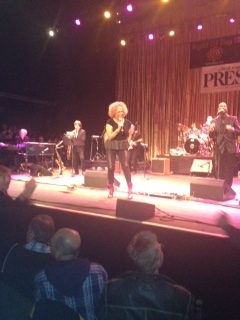 But the star status, with Springsteen not on hand, went to headliner Darlene Love. The Rock ‘n Roll Hall of Fame member took the stage for a nearly 45 minute set backed by a seven piece band and three singers. Love proved that not only does she possess one of the richest voices in Rock ‘n Roll, she has one of the tightest bodies… poured into a form fitting gleaming black leotard the audience not only heard her thunderous voice, she left no doubt where it was coming from. Phil Spector records are featured heavily in Love’s concerts. In a 2010 interview for my program “ON THE SCENE,” on News 12 New Jersey (watch this interview on the Credits page of johnbathke.com) Love told me that without the work she did with Spector, she believes that she would not have been inducted into the Rock ‘n Roll Hall of Fame. She was under contract to Spector for much of the 1960s, recording lead and backing vocals on countless records. Most famously, Love’s voice was the lead vocal on the number one 1962 hit, “He’s A Rebel.” But Spector released the song under the name of his more popular girl group “The Crystals” and Love went uncredited for years. This led to lawsuits that Love filed against Spector to obtain credit and compensation. Love finished with “River Deep-Mountain High,” a record that she had asked Spector to let her record. Instead, he chose Tina Turner for the 1966 recording and Love was relegated to singing back-up, an experience she recalled as “miserable” in her 1998 memoir, “My Name Is Love.” The session dragged on for hours in a sweltering studio, she said, as Spector demanded that Turner sing the song dozens of times until her voice had the hoarse and weary quality that he wanted. Love said she thought the finished product sounded like “crap” and, in fact, “River Deep-Mountain High” was so poorly received at the time that Spector went into seclusion for years afterward. But the song has become a rock ‘n roll standard and Turner seldom performed a show without it, right through her 50th anniversary tour in 2008-2009. Aside from Turner, Love is now the premiere interpreter of the song that she so badly wanted for her own more 45 years ago. Love’s performance, as with night’s others, lacked meticulous acoustics which is the most common problem in these multi-act concerts where the stage must be quickly reset between performers without sound checks. But the night was first and foremost for a cause and the Light Of Day Foundation expected to raise 300 thousand dollars. You are currently browsing the John Bathke's Blog blog archives for January, 2013.